Wait a minute. 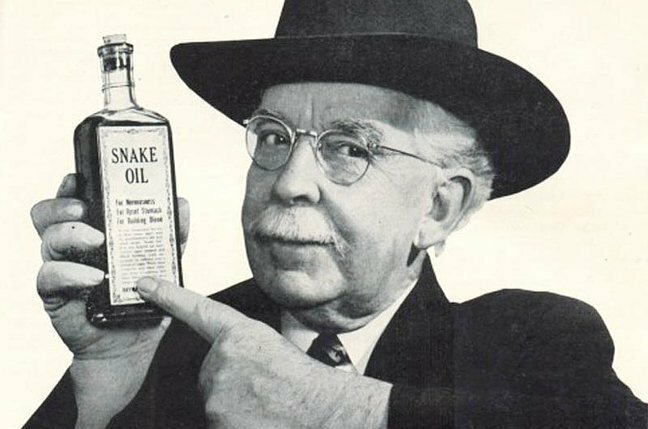 What does snake oil have to do with cannabis? Well, I take it most of you have seen some sort of advertising for CBD oil as a wondrous discovery of the last few years. It seems to be drawing a great deal of attention and, since it is not psychoactive (God forbid), it can be purchased almost anywhere online or in stores -- not only in the USA but abroad as well. What is going on? Is CBD oil a 21st century snake oil? Interestingly, when one looks at the history of snake oil, there are a number of parallels with what is currently happening with CBD oil. Originally snake oil was used as a Chinese medicament made from the fat of the Chinese water snake (Enhydris chinensis) and used for centuries in Chinese traditional medicine. When it was introduced into the US during the 19th century, however, it rapidly became a patent medicine with nothing from snakes in it, using deceptive marketing, and boasting claims of being a panacea. It was also overpriced and falsely advertised (isn’t capitalism great?). Did the original Chinese snake oil really work? Probably, since it was utilized for centuries and still is used in traditional Chinese medicine. But in the West, its name became synonymous with something of no real medicinal value and quackery. It appears that CBD oil may be following the same path. Originally CBD oil was made from cannabis strains containing high CBD levels like AC/DC, Harlequin, Cannatonic, and Charlotte’s Web. It is used to treat children with rare, severe forms of epilepsy such as Dravet Syndrome or Lennox-Gastaut Syndrome. There are now dozens, if not hundreds of producers and sellers of CBD oils around the world using various sources and methods of extraction, production and administration. Since there is a heated debate concerning its status as simply a food supplement or a medicine, current regulatory demands and controls vary widely. Labeling and advertising is, for the most part, like snake oil in a Wild West show. Cannabis oil has become a miracle cure for a slew of ailments such as ADHD, autism, Alzheimer’s, Parkinson’s, multiple sclerosis, chronic pain, cancer, and even for your pet’s anxiety, appetite and sleep problems. Step right up! But research has shown that many CBD products on the market do not contain what the label claims (if it says anything at all about the content); in some cases, they do not even contain any CBD at all! (see Hazekamp and Consumer Reports). Of course, we could argue that CBD does no harm, so why not just use it? This would be okay if people did not use it as a substitute for standard treatment; we could rely on accurate labeling, quality control for dangerous contaminants and accurate dosage (CBD has a bell-shaped therapeutic effect), and that CBD seems to be more effective when combined with some THC and other cannabinoids and terpenoids. So at the moment, the advice remains, “buyer beware!” Look for CBD oil that is under some form of regulatory control that can be found in some states (such as California) and countries. Ask for third-party lab analysis results from the producer. Demand quality control, clear labeling, and responsible advertising, or step into the role of the “country bumpkin” at the local Wild West show of years gone by. Yes Sir-eee!